MacDermid Printing Solutions’ analog or conventional sheet photopolymer products are available for virtually any flexographic printing application and any platemaking technology. From flexible film to corrugated boxes, MacDermid provides a high-quality sheet photopolymer plate product to fit your needs. 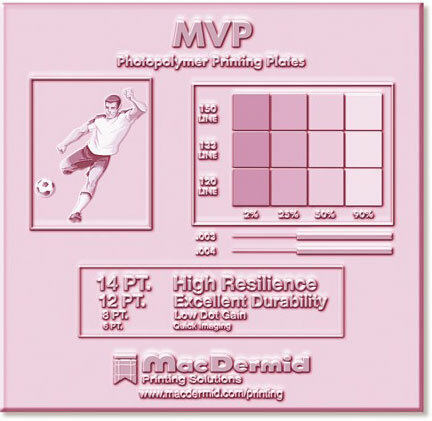 MVP is the Most Valuable Plate for your printing needs and is the newest medium durometer, analog sheet plate from MacDermid. Its durable design results in higher quality print and increased productivity. This 50 durometer plate has exceptional resilience, allowing for faster press speeds and reduced bounce. Ink transfer is enhanced, delivering extremely smooth solids and crisp, clean-running process color images every time. Our NEW MacDermid MGC plate is the latest entry into the corrugated marketplace. MGC challenges competitive products with outstanding imaging capabilities and significantly reduced processing times. MGC is able to image a 2% 100 lpi in a 250 mil plate while eliminating the need for back-masking and substantially reducing undercutting in fine lines. Its processing times offer a 30-45 minute cycle time savings when compared to competitive products. Our premier capped photopolymer plate, EPIC was designed to meet the special needs of high resolution process color printing and has proven its value over and over in just about every flexo printing application. The patented cap technology on all EPIC plates allows printers to get high solid ink densities and print fine details at the same time. EPIC’s exceptional exposure latitude also makes platemaking easy and eliminates the need for masking. Epic is well-suited for high quality printing on labels, film, preprint liner, and lined corrugated when litho quality graphics are required, and is fully compatible with solvent-, UV-, and water-based inks. MacDermid MAX is the newest and best performing hard, analog sheet photopolymer plate from MacDermid. 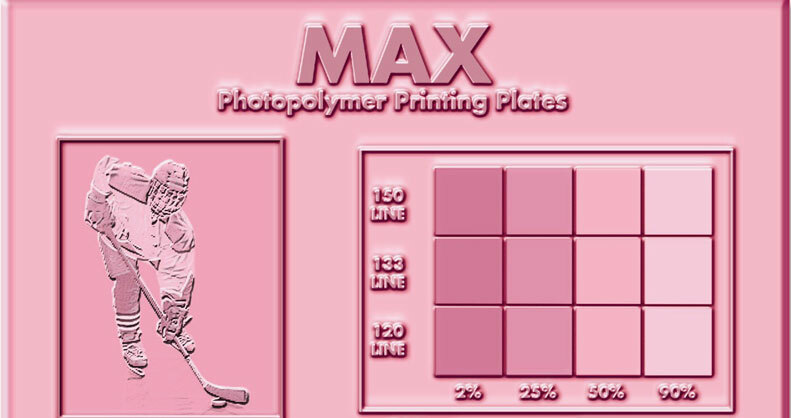 MAX plates work well with a wide variety of substrates and ink. This 60 durometer plate has excellent drape characteristics, making it well suited for applications involving small-diameter cylinders on narrow web presses. 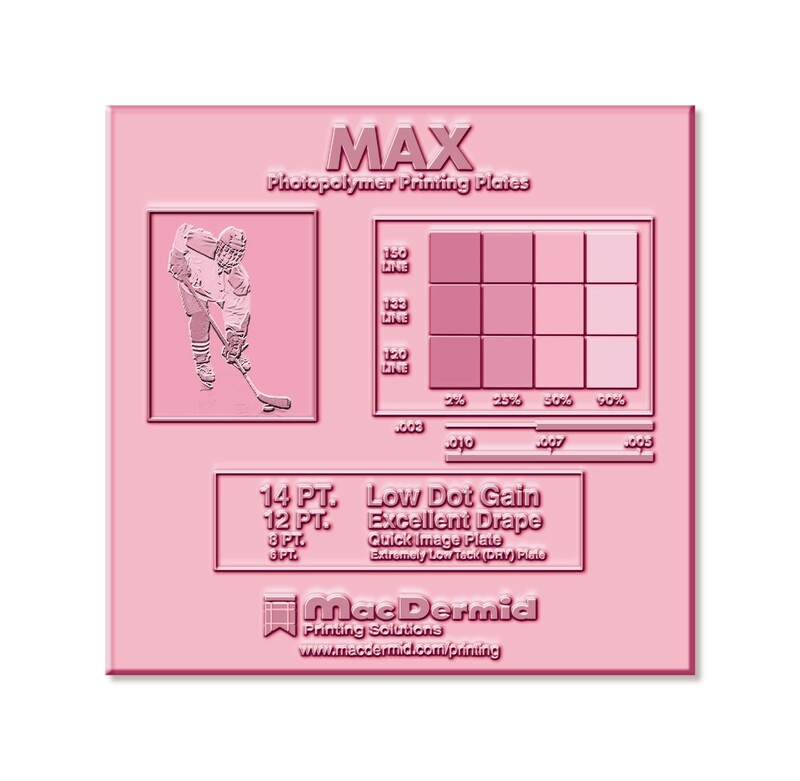 MAX is also an extremely low tack plate, which allows long, clean running print performance.